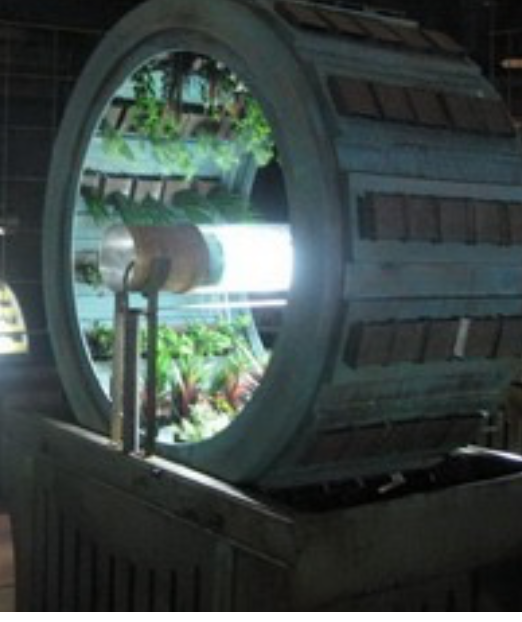 As seen on the new television series StarGate Universe (SGU), the Volksgarden (R), a futuristic/ancient/timeless, rotary garden, comprised of a 4 foot diameter, horizontal rotating cylinder housing rows of plants growing towards a central light source. The cylinder slowly rotates the plants around the light while watering the roots at the base in a tray with liquid plant foods. 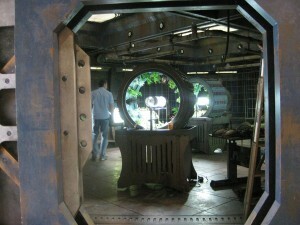 It was a surprise to us that Stargate decided to use our systems in their new TV series. 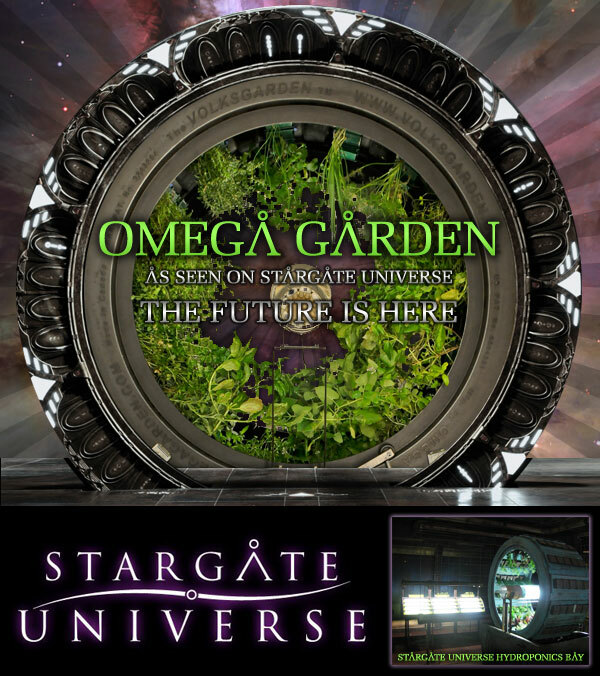 I thought it had something to do with the fact that our Volksgarden TM resembles the Stargate but I was told that this was not the reason, and they hadn’t noticed that. I guess some things are too obvious to notice. Like past Science Fiction series (Star Trek, Battle Star Galactica, etc.) that examined pressing issues of the day on earth by transporting the issue to far flung worlds, my hope for SGU is that a very serious discussion and investigation can take place about this type of biomass production and how it can help humanity live within sustainable means while improving our standard of living and quality of life. In reality we are on a spaceship called Spaceship Earth, and we are really in a survival situation with limited water, land, air, and other resources. Food is wastefully shipped all over the world, and resources used like we have dozens of planets and worlds to plunder. I think the writers of Stargate are geniuses (in the same vein as Gene Roddenberry creator of Star Trek) seeing into the future, and I believe this is an unprecedented opportunity to create abundance in a scale never before imagined on our planet/ship’s history. This concept has been in development for more then 20 years, and with Stargate’s unexpected bump the next 2 years we may be able to accomplish the kind of mass movement necessary to make the kind of leap that would see us live in sustainable way without the kind of ‘crash and burn’ scenarios the doomers say is coming. A concept has been hatched to let everyone get involved, called ‘YouGrew’. YouGrew is a community farming concept where we grow in indoor highly controlled environments producing the cleanest foods locally to you where ever you are. Check it out at www.yougrew.com, and learn how you can get a YouGrew facility started in your neighborhood. Food grown in YouGrew facilities will use the least amount of water to grow your foods, and will not pollute soil, nor discharge chemical fertilizers into our waters that pollute the Earth. You can also get a Volksgarden for your home, or start your own farming operations using Volksgardens, or Omega Garden Carousels. Come back often to check up on the progress we are making to this end, or sign up to our Twitter account for either http://twitter.com/omegagarden, or http://twitter.com/yougrew.